Wear your own trousers with this outfit, similar sword sold separately. Prepare for a knight to remember?. A night that is, and let your imagination take you back to the time of Sir Lancelot and the Knights of the Round Table. 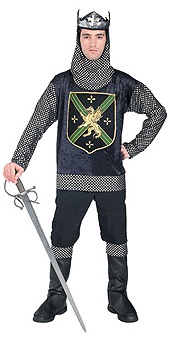 This sword weilding protector of all that is noble may be the King of the County but he's also a fierce warrior. This Warrior King costume combines the chain-mail battle armour of the knight, with the crown and regality of the King.